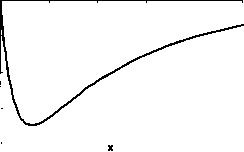 This appendix describes a number of equation types that can be used for curve fitting. Some of the equation types can be handled by Excel's Trendline utility for charts; these cases are noted below. Multiple Regression. Multiple regression fits data to a model that defines y as a function of two or more independent x variables. For example, you might want to fit the yield of a biological fermentation product as a function of temperature (7), pressure of C02 gas (P) in the fermenter and fermentation time using data from a series of fermentation experiments with different conditions of temperature, pressure and time. Since you can't create a chart with three jc-axes (e.g., T, P and t), you can't use Trendline for multiple regression. Figure A4-1. Polynomial of order 3. The curve follows equation A4-2 with a = 5,b = -\,c = -5 and d= 1. The Trendline type is Polynomial. The highest-order polynomial that Trendline can use as a fitting function is a regular polynomial of order six, i.e., y = ax6 + bx5 +cx4 + dx + ex2 +fx + g.
polynomials such as y = ax + bx + cx + dx + e. Exponential Decrease. Figure A4-2. Exponential decrease to zero. 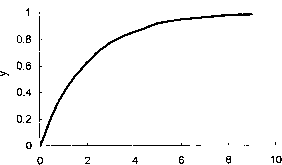 The curve follows equation A4-3 with a = 0.1 and b = -0.5. The Trendline equation is shown on the chart. The sign of b is often negative (as in radioactive decay), giving rise to the decreasing behavior shown in Figure A4-2. 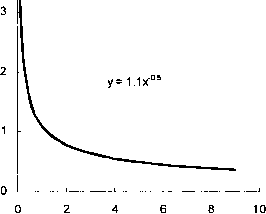 The linearized form of the equation is In y = bx + In a; the Trendline type is Exponential. Exponential Growth. If the sign of b in equation A4-3 is positive, the curvature is upwards, as in Figure A4-3. Figure A4-3. Exponential increase. 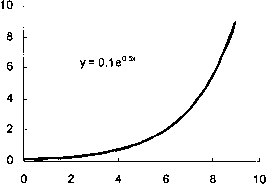 The curve follows equation A4-3 with a = 0.1 and b = 0.5. The Trendline equation is shown on the chart. Excel's Trendline cannot handle data of this type. Figure A4-4. Exponential increase to a limit. 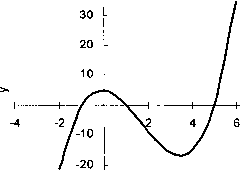 The curve follows equation A4-4 with a = -\,b = -0.5 and c = 1. The linearized form of the equation is In (y - c) = bx + In a. Double Exponential Decay to Zero. 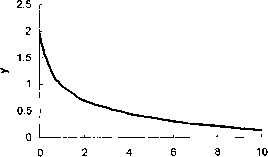 The sum of two exponentials (equation A4-5) gives rise to behavior similar to that shown in Figure A4-5. 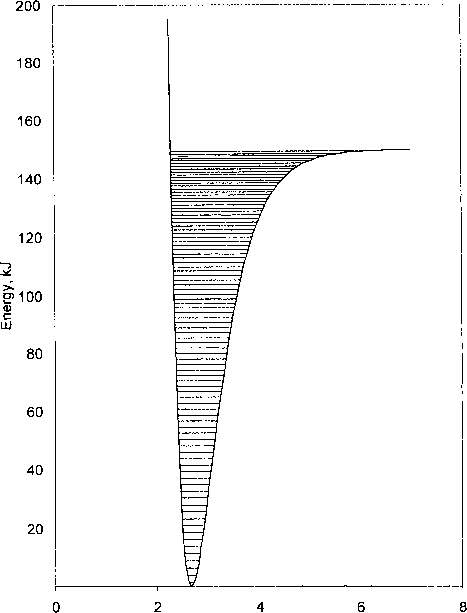 This type of behavior is observed, for example, in the radioactive decay of a mixture of two nuclides with different half-lives, one short-lived and the other relatively longer-lived. Figure A4-5. Double exponential decay. The curve follows equation A4-5 with a = 1, b = -2, c = 1 and d = -0.2. 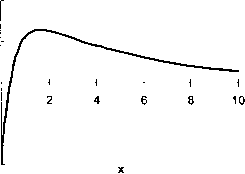 If the second term is subtracted rather than added, a variety of curve shapes are possible. Figures A4-6 and A4-7 illustrate two of the possible behaviors. Figure A4-6. Double exponential decay. The curve follows equation A4-5 with a = 1, b = -0.2, c = -2 and d = -2. Figure A4-7. Double exponential decay. The curve follows equation A4-5 with a = 1, 6 = -2, c = -1 and d = -0.2. Equation A4-5 is intrinsically nonlinear (cannot be converted into a linear form). Power. Data with the behavior shown in Figure A4-8 can be fitted by equation A4-6. The curve follows equation A4-6 with a = 1.1, b =-0.5. The Trendline equation is shown on the chart. The linearized form of equation A4-6 is In y = b In x + In a; the Trendline form is Power. How to fit a curve in excel? How to calculate power curve fit in vba? How to create decreasing curve in excel? How to curve fit excel exponential? Why can't a linear trend line determine the total fermentation time? How to do a curve fit with linest in vba?